Hey Uber drivers, we all appreciate the work you do to shuttle us around when we need a lift. Thanks to you, our roads are safer, but it comes at a price to your vehicle. A dirty vehicle will cost you. An important part of your success as an Uber driver is your ranking–Uber has stated that drivers with less than a 4.6 rating are no longer on good terms with the company. Plus, the higher your rank, the more inclined passengers are to accept a ride, so you’re going to want to keep your score nice and high. The drivers with the highest ratings don’t have the nicest or most expensive cars, but they do have the cleanest. Below, you will find our tips for maintaining a high rating. Be Prepared for Disaster. Smart drivers know that Friday and Saturday nights are where the money is. However, these times are also associated with the queasy underbelly of society. It’s a good idea to have gallon zip top bags on hand. With enough warning, you can offer one to a passenger and save your car’s interior. Another good idea for reinforcement? Rubber floor mats. Just carefully remove them, dump them out, and hose them off as needed. Get to Know the Area. Your GPS isn’t perfect, so it’s a good idea to develop a solid sense of direction. Customers want to take it easy while en-route, not copilot for their driver. Until you’re used to where things are, spend some time every day studying the map of your area. You’ll be a regular Ferdinand Magellan in no time! Dress and Act Professionally. Your car is your office, so don’t show up to work dressed like a slob. While this position doesn’t necessarily call for business casual, sweatpants and a dirty t-shirt don’t leave your riders with a great first impression. The same goes for your behavior. Don’t check your phone or take calls while you’re driving, and make sure you stay courteous. If you’re in a bad mood, don’t turn on the app. Get Your Car Detailed at Ricks on the Regular. High traffic in and out of your car often leaves behind a mess. Trash, stains, and odors can all negatively affect your rating. While DIY cleanings will do in a pinch, there are some messes that are better left to the professionals. We have you covered. 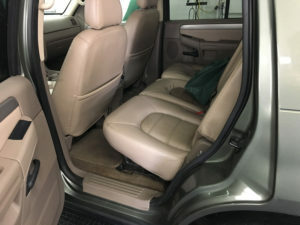 Rick’s full detailing service will get your vehicle fixed up and ready to go! After driving strangers around all day and night, you and your car both deserve it. To schedule, fill out our online form or call 610-449-4455.